Replacement:DEV-10958. In the new version, we've changed the labeling on the LEDs to make more sense. We've also connected the speaker to ground so that only one I/O pin is required to get the buzzer working! This page is for reference only. The "LilyPad FTDI Basic" is listed In the "Included on the Board" section but I don't see it on the board in the photos, is it included separately? 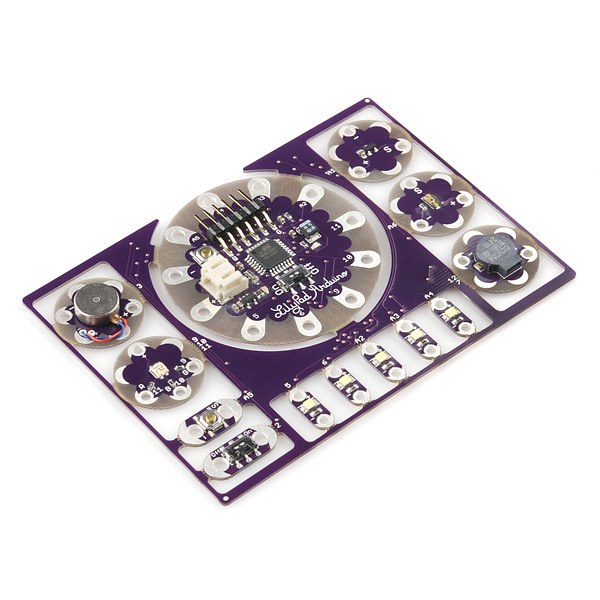 The LilyPad FTDI Basic is included in the kit (not as part of the ProtoSnap board). We updated the description so it is a bit more clear. Can you publish the source of the program that's pre-installed on these? Definitely. I just added the sketch under the "Documents" section up top. Or click here. Never paid much attention to "sewable" electronics before - guess I'm the sort that would want to merge my car or something like that with the stuff I build instead. Pondering the Lilypad concept, however, with all this exposed electronics, how does this stuff deal with static electricity - seems to me if you sewed this stuff onto some nice polyester, you could build up quite a charge, especially in the winter. Snap, and it's dead. this is Awesome, Quick question could the temp sensor sense a hot flash, I'm thinking of making a jacket that lights LED's to different moods.